The desire to remember a lost loved on through memories and keepsakes goes back as far as human history. Precious Memories are keepsakes that allow you to remember the one who has passed in a truly unique and powerful way - with a tangible imprint that captures the unique impression every life makes on our own. Captured from an inked fingerprint, hand print, or footprint, each one is both unique and everlasting - preserving in precious metal every line and contour for countless generations to come. Precious Memories are available in Sterling Silver, as well as in 14kt. Yellow or White Gold. Precious Memories keepsakes are handcrafted in the USA. Click here for sample photos of the various types of jewelry available, And scroll down below for an order form that, went filled out, is emailed directly to us. L (Large size), R (Rimmed item), No letter (Standard size with no rim). 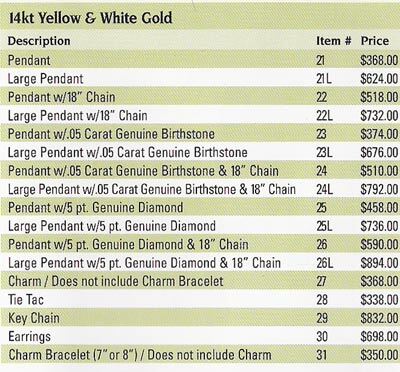 When ordering a Gold item, indicate Y (Yellow Gold) or W (White Gold).